Though released only a decade apart, Airplane! and Airport can’t have had themes and motives further from each other. The former, having been released at the onset of the goofy 1980s (think leg warmers and neon) is a comedy of the lightest proportions. The jokes are gimmes and the acting is over but all on purpose and the viewer is supposed to be in on the joke. It’s a smart comedy that way. Airplane is a comedy of comedies, still cited today as a tongue-in-cheek pièce de résistance of modern comedic film. The ! says it all. Airport, 1970’s understated drama about fateful night at an airport where everything that can go wrong does, stars an ensemble cast whose stories intertwine in a series of random and intersecting events, all of which seem unconnected but together they both create and solve the main conflict. D.O. Guerrero, played by Van Heflin, is mentally ill, out of work and luck and wants to provide for his wife via insurance fraud. In a laughable amalgam of anachronism he both buys insurance (presumably approved on-site) and boards the plane with his homemade bomb, as the staff are entangled in office politics, the man blows up the plane. These themes are almost too relevant post-9/11. There’s humor here but nothing to the effect of Airplane! 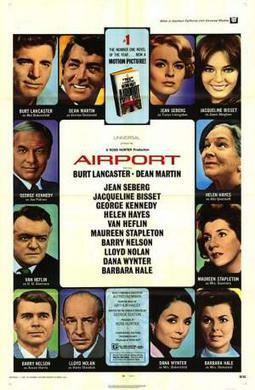 Airport is a drama about people and has flown under the radar of modern classics, largely because 1970 was Patton‘s year. Air travel in film emphasizes missed connections, something that connects Airplane! and Airport, even though all evidence points against it. The setting is normalized either around an airport or on a plane and drama is built-in via strict scheduling. Unlike other forms of transportation, once an airplane embarks, thirty-thousand feet separates two major settings – the eponymous airplane and airport. Luckily, we have communication systems to iterate between the two, but for intents and purposes, 1960s and 1970s air travel provides a ripe setting for this concept of missed connections; the plane being just full or just departed. Lovers can literally be star-crossed, seeing as one of the milieu is closer to the heavens. Both movies excel in this regard, but Airport sets itself apart because drama is so much more compelling than comedy within this environment. Not that Airplane! is any less successful, but Airport excels because a plane crash has no proxy. Its beginnings, complicated, its climax, usually avoided, and its dénouement, often resolved, either for better or worse. Within Airport‘s context, the intertwining stories feel natural, if not too realistic, allowing an “in” for the average viewer: lots of people have a wacky grandmother or aunt, lots of people have unresolved love issues, lots of people have uncertainty in their job and people questioning their motives. All the time. Airport showcases all of these themes through deft acting and tight scriptwriting through the highly dramatized medium of the aviation industry. Not only do the themes and settings provide for compelling story, the legendary execution rounds out the quality of Airport. Both Burt Lancaster and Dean Martin had had storied careers up to this point, during and afterward. One could argue that, like the year 1970 in film, Airport provided an apex for the actors as well. Airport also provided a continued launching point for actress Jacqueline Bisset and legendary Helen Hayes with her second Acting Oscar, almost 40 years after her first. These performances alone earn Airport fair standing as a classic, but agglomerated, Airport becomes legendary. Which is unfortunate that Patton saw release in the same year. I have argued before that 1970 and Patton in particular provided a massive turning point for how movies are made and viewed. The other movies released in 1970 (MASH, Five Easy Pieces and Love Story) along with Airport are unfortunate remnants of one of the greatest movies ever made. That said, Airport (and to an extent Airplane!) has earned a spot in the lore of the modern filmmaking, within or without the tombs of The Academy.